Peter Daniel Loewen: churchman and farmer; born 22 October 1902 in the Miloradovka colony in South Russia. Together with his twin brother, Bill, they were the sixth and seventh children in a family of eight born to Daniel and Susanna (nee Braun Neudorf) Loewen. 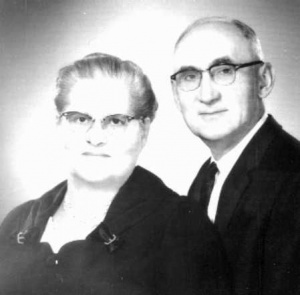 He was baptized by immersion 7 May 1923 and joined the Mennonite Brethren Church in Miloradovka. He resided in Miloradovka with his parents and siblings until their emigration to Canada in 1923. Peter D. Loewen was married to Anna Redekopp (1907-1994) on 22 May 1932 in Yarrow, British Columbia. John A. Harder officiated at the wedding ceremony. Nine children were born to Peter D. and Anna Loewen—three boys and six girls. Peter D. Loewen passed away 23 February 1993 in Abbotsford, BC. After arriving in Canada in 1923, Peter D. Loewen found employment on a farm, first in Acme, Alberta and for the next two years in Hanley, Saskatchewan on Sheldon Farms. During the winter months of 1924 to 1926 he attended the Herbert Bible School in Herbert Saskatchewan. Loewen was interested in education from his early youth, but the 1917 Revolution, World War I, and the difficult years when Makhno terrorized the Ukraine where the Loewens lived, interrupted and all but shattered his dream of a high school education and a career in education. In Canada, he took every opportunity to further his education and to acquire biblical knowledge. After graduating from Herbert Bible School he enrolled in the Winkler Bible School in Winkler Manitoba in January of 1927. He graduated from the Bible school in the spring of 1928 but stayed in Winkler to complete Grade 10 in the local high school. In 1930 Peter D. Loewen and a number of his friends had the urge to go west to explore new opportunities of making a living and of service in areas for which their Bible school training had equipped them. Loewen arrived in Yarrow, BC on Good Friday of 1930. Very soon the Yarrow Mennonite Brethren Church, which had been founded in February of 1929, recognized his gifts of teaching and his leadership abilities. He was one of the founders of the Elim Bible School and also the first teacher (1930-1932). During the summer months he found employment on farms in Yarrow and Sardis, BC. After his marriage to Anna Redekopp, Loewen began to farm in earnest to support his growing family. Poultry farming proved to be very successful as did raspberry farming. In 1957 his crop yielded 9 tons of raspberries per acre, which earned him the distinction of Raspberry King of the Fraser Valley. Loewen enjoyed farming, which proved to be a lucrative business, but his first love was ministry in the church and to his fellow men. During his many years of ministry he taught Bible school in Yarrow, German school and Sunday school. In 1930 he was ordained to the Ministry by the Yarrow Mennonite Brethren Church. In 1937 he was elected as the Superintendent of the Yarrow Mennonite Brethren Sunday school, a position he held for 26 years. He was noted for his innovative ideas in matters of Sunday school curriculum development and teaching. Loewen's motivation came from studying the Scriptures, attending Sunday school conventions and observing gifted teachers. The Loewen's moved to Clearbrook in 1969, while still attending the Yarrow Mennonite Brethren Church for 6 years. In 1976 they became members of the Clearbrook Mennonite Brethren Church where Peter D. Loewen continued his preaching ministry as well as serving on various boards, including the board of the Mennonite Educational Institute for a number of years. Anna Loewen was a gifted Sunday school teacher and served in this capacity in the Yarrow Mennonite Brethren Church for many years. In Clearbrook she rendered beautiful service in the Menno Home and hospital singing and playing the auto harp together with her friend, Anna Bartsch. Anna sang in a Ladies' choir and was also very active in a Ladies' Aid Group as long as her health permitted both in Yarrow and in Clearbrook. Peter D. Loewen is remembered first of all as a churchman. He was a pillar in the church--progressive, broadminded, a deep thinker, and a visionary. But he was also an outstanding farmer, using scientific methods that contributed to his success in poultry and in raspberry farming. Memoirs of Peter Daniel Loewen—A Story of God's Grace and Faithfulness. Chilliwack, BC: 1999. Interviews with Peter Daniel Loewen in Abbotsford, BC, 1990-1992. Klassen, Agatha E. "Loewen, Peter D. (1902-1993)." Global Anabaptist Mennonite Encyclopedia Online. April 2002. Web. 18 Apr 2019. http://gameo.org/index.php?title=Loewen,_Peter_D._(1902-1993)&oldid=92463. Klassen, Agatha E. (April 2002). Loewen, Peter D. (1902-1993). Global Anabaptist Mennonite Encyclopedia Online. Retrieved 18 April 2019, from http://gameo.org/index.php?title=Loewen,_Peter_D._(1902-1993)&oldid=92463.